LONG ISLAND CITY — Senator Chuck Schumer may live in Brooklyn, but he loves biking in Queens. During a meeting with business and community leaders in Long Island City on Friday morning, Schumer said bike rides are his “favorite moments” in Queens, a borough he partially represented in the U.S. Congress for 18 years. The senator, who lives in Park Slope, said he’s got his favorite bike routes in the borough and that he was planning a trip into Queens on Saturday. He said Ridgewood was the first neighborhood on his bike route map, followed by Middle Village and its Juniper Valley Park, followed by Elmhurst. 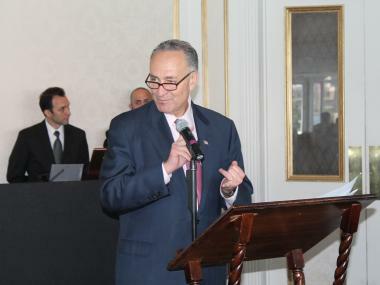 “I love Elmhurst Avenue with its old apartment buildings,” Schumer said. He also praised 34th Avenue in Jackson Heights for its great bike lanes, and said he planned to finish his trip by biking along the water, passing through Astoria and Long Island City.